Artist's 3 bedroom family home on edge of peaceful hillside Drome wine village. Our romantic house is well equipped, comfortable & roomy. Restoration retains rural village character: white walls, wide pine & red tile floors, oak beam ceilings. Roomy farm kitchen. Serious 4 burner butane stove with all utensils. Rustic fireplaces (decorative in season, functional in winter). Our self-catering holiday rental on village edge has a vine shaded breakfast balcony with partial view onto valley of vineyards & apricot orchards. Bath has 2 showers, 2 sinks & reading/waiting room outside. Separate WC. Master bedroom with fireplace (working in winter) & queen-sized bed. Smaller 2nd bedroom has double-sized bed. Additional 3rd bedroom (supplement) is available for large families traveling with children (double sized bed & bunk beds). Cheerful living room off the Master Bedroom is a comfortable place to read / relax. Bike storage in basement, parking just steps away on village square. If we're in town, your first French breakfast (coffee & village bakery croissants) is complimentary. Just let us know. Venterol is a peaceful hillside Cotes-du-Rhone wine village with its own bistro / restaurant on the square, a second smaller restaurant, and an excellent pastry baker offering morning-fresh baked croissants & baguettes. It has arcaded narrow streets, traditional 'lavoirs' for laundry, and a lovely church with an exceptional wrought iron belfry. A vast lavender harvest occurs in mid-July with numerous tiny distilleries perfuming the air. There are sunflower fields and olive, apricot and cherry orchards. Shepherds still watch flocks near hamlets on the mountain roads toward Dieulefit and Comps. Village summer festivities feature fireworks, music, and an August village feast with dancing. Our bistro (indoor and outdoor dining) serves great lunches and evening meals under shady plane trees. Our second restaurant (the former Cafe de La Poste) also provides more intimate outdoor dining on Place Sabarot. Farmers sell goat cheese bedside the Mairie once or twice a week and a A mobile pizza oven positioned across from Le Temple, our municipal art gallery and concert space. Every Thursday will discover one of Provence's liveliest Market Days in Nyons, right next door. Nyons also has many cafes to choose from. Nyons (1.7K) has its own Cinema Arlequin, many cafes and restaurants, an outdoor theatre, tennis, supermarkets, banking & services... plus one of Provence's best Market Days. Nyons has a complex Aquatic Park (outdoor Municipal Swim Center) with cafe ...a great place for cool family fun. Another unique public pool is found beneath the Marquise-de-Sevigny's huge Renaissance castle, at Grignan 25 minutes away. Or you can swim and hunt fossils in mountain streams right behind Venterol. There innumberable wine tasting possibilities all around our region. You can bicycle amidst seas of Cotes-du-Rhone vineyards. Or hike and ride horseback along the high altitude mountain trails of the French Resistance. Many excellent museums bejewel nearby villages: museums of the Silk Manufacturing Era, of Olive Oil, of Lavender Distillation, and even of Cardboard Box Manufacturing. There are music, opera & dance spectaculars in Vaison-la-Romaine, Orange, Arles and (a day trip) Nimes. In July, the Avignon Theater Festival offers a vast array of productions. Where is Venterol situated? : Venterol is located near the Rhone, on the southern edge of the Drome Provencale and Vaucluse, in the Region of Auvergne-Rhone-Alpes. We are on an interesting climatic divide: To our south, a warm and dry 'Midi' climate extends past Mt. Ventoux, through the Plateau of Vaucluse and the Luberon, to the sea. To our north, reaching up to the high mountains of Vercors, the climate is cooler and vegetation greener. Flocks graze the slopes. Corn grows, sunflower and poppy fields border blazing yellow scotch broom. Venterol is close to the Rhone River and the Gorges of Ardeche (kayaking and limestone cave exploring) to the west. Right next door (8 minutes away) are Valreas and the Knights Templer town of Richerenches, both in the ancient Enclave des Papes. Suze-la-Russe Castle, a must-visit for our rental guests, is home to the renowned International University of Wine. This Renaissance castle is owned by the Dept. of Drome, as is Grignan castle. Multilingual visits to both are possible. Please note a security deposit will need to be paid upon arrival and will be fully refunded on check-out. As a semi-retired professional travel/corporate photographer who has lived at least 3 months a year in Provence since discovering this village in 1969, Venterol has always provided a vital annual dose of good food, clean air, beauty, peace and quiet.... everything necessary in which to paint, photograph, discover, breath fresh air and make friends. After earning my BFA and MFA degrees at Rhode Island School of Design and Yale, I traveled the world on assignment for many European / American magazines and major corporations (incorporating my design training at both Rhode Island School of Design and Yale School of Art & Architecture). Now, I exhibit my Art Photography in our own nearby medieval courtyard. For all these years Venterol has been both refuge and solace for my family and our guests. My wife maintains this accounts for our excellent health. At any rate, after traveling the world, it is the place where we feel most at home. In 1969 my girlfriend and I were looking for something as a pied-a-terre in France. I had already lived in Paris and could imagine the possibilities of such an idea. An Italian friend of ours suggested Venterol, directing us to two Swiss women who wanted to sell their summer refuge. The village was nearly abandoned, many empty buildings with black, gaping windows... streets with open sewers, one habitually empty crumbling cafe. The house I bought had dirt floors, primitive plumbing, no electricity, a bed with straw mattress, leaky roofs, no windows and resident scorpions. But it was very large, a complicated labyrinth layout: I was seduced by its many rooms, the attached farm buildings, and the seemingly endless possibilities. I worked summers from dawn to after dark, cutting new windows into the walls, tiling floors, surfacing walls, re-doing roofs... all that was necessary to just make the place barely habitable. Over the years, each time returning with some of the winters earnings to invest in improvements, the house began to become what it is today. In the huge suitcases permitted at that time, we brought over many personal items, both art work and furnishings.... ultimately making this place both home-like and welcoming. I always loved the nest-like shape of our village, clinging to the slopes of mountains behind. It also pleased me that the house was situated on the outer edge with a partial view of the valley below. Why this property? Because a little boy from New England once dreamed of castles and knights, and then, years later, found a place where they actually once existed. Besides that, my father farmed, so I like being around farms, farmers and the growing cycles. Olives, apricots, lavender, wine grapes, the Mediterranean diet mixed with dependable sunshine: all the ingredients to make one healthy and happy. A lot of great cultural things to do: concerts (jazz and classical), painting galleries, opera, choral music, theater. Art Galleries in Valreas, Nyons and Venterol (Le Temple). Cafes nearby that are perfect for settling back with a "cafe- creme" to read Le Monde or Liberation. Plus some of the most interesting, kind and generous people I have ever known. Two Shower enclosures, Two sinks. Newly tiled floor. Toilet in separate room. Bring your own mobile phone. In an emergency, the owner's adjacent house phone may be used. Fireplaces not used during warm months of June, July and August. 2, European style in service area. Clotheslines and intense Provencale sunshine. All bath towels, wash clothes, dish towels are provided. *We reduce rent if you prefer to bring your own linen. Ask us. WiFi works in this house. (In Summer Season) Decorative antique tall cylindrical blue enamel Venetian wood/coal stove situated between Master Bedroom & Living Room. Large upright with 4 shelves, more in door. Separate freezer section at bottom. In modern self-igniting stove with top cover. Glass 'Silex' style. Also large traditional octagonal Italian coffee maker. Shelves for groceries that do not require refrigeration. All provided, many glasses and coffee cups. Plates of graduated sizes, many forks, knives, and spoons. for 8 persons or more. Wine glasses, pots & pans of graduating sizes, etc, etc. A warm traditional feeling recalling when this was a farm kitchen. Traditional large red floor tiles.. Snug sink area with tiled walls. Plenty of paper towels, liquid soap, waste basket bags. Farm kitchen with Breakfast Balcony, large 'American style' refrigerator, 4 burner gas oven stove, dishes in cupboard, all utensils, including cut boards, salad swirl, coffee maker & cherry pitter. Nearby vegetable garden may be used for quiet reading by those renting. Breakfast Balcony with partial view of vineyard valley below village. Mountain Hillside Village Houses are not ideal for those who are handicapped or have difficulty climbing stairs. Wonderful Water Park (Parc Aquatique) 10 min away in Nyons. Exellent family restaurant on an overlooking terrace. No smoking within the house please. Pet friendly but you must always ask us first. Kitchen has large fireplace. Master bedroom also has fireplace... both strictly decorative during warm months. A library of guide books is available to loan for local and 'day trip' discoveries. We can also loan you the maps you'll need. In addition, we have written a guide to "magical" places in our area... non-commercial sites discovered during our 42 years of ownership. Whether it's nearby Nyons, Vaison-la-Romaine, Grignan & Orange.... or down to Arles, Aix, Carpentras or Nimes..... years of collected information awaits ready to help. Free parking steps up a path to the cafe. Basement bike storage. The Arlequin Cinema Club in Nyons (5 min) shows fine films from both past and present. Partially subsidized by the municipality, this cinema is truly a cultural asset. WiFi works in this rental. Si vous cherchez une habitation typique d'un village provençal et qui a une âme, l'appartement de la Famille Haling, mitoyen de leur maison, est à recommander. Maison de village donnant sur des rues étroites, l'habitation est rustique mais décorée avec soin. On y trouve notamment de superbes photos du propriétaire, par ailleurs artiste. Comme toutes les maisons dans ce type de village, il n'y a pas d'espace extérieur (hormis un balcon) et pas de possibilité de garer sa voiture près de la maison, mais il y a une place charmante à proximité (où l'on peut se garer), avec un café-restaurant très agréable sous les platanes. Pour les familles, il y a un parc près de l'école du village où les enfants peuvent jouer en toute sécurité. Enfin, l'accueil des propriétaires, amoureux du village, est très sympatique et leurs conseils avisés permettent de découvrir tous les charmes de la région. What a great place! My wife, 11 year old daughter and 3 year old son just got back from our 11 days in Venterol: we loved the house. It was perfect for us -- we could easily have accommodated a fifth family member (there's a bunk bed in one of the rooms that we didn't use). The house is decorated with antiques and art work. It feels very real and very homey -- it doesn't have the sense of an artificially created "vacation home" environment. That's a crucial consideration for me. The kitchen is big and easy to work in. We shopped in local markets -- held weekly in the nearby towns of Nyons and Valreas, with amazing, very affordable produce and of course cheese and the other ingredients of French cuisine. We mostly ate at home, which was healthy, economical and delicious. French big box style stores are also conveniently nearby -- a sad development, but the food there equals what you can find in a place like Fairway in NYC. There is a bakery in Venterol itself, as well as a wonderful small restaurant and a more typical bistro in the town square. I had never heard of Drome or Vaucluse before -- these are the two "departments" closest to Venterol (it's in the former). I'm very glad we ended up there, rather than further south, more in "Provence" proper. Venterol's region is far less crowded and expensive, but I found it to be exquisitely beautiful. Venterol itself lies up against small mountains (high hills? 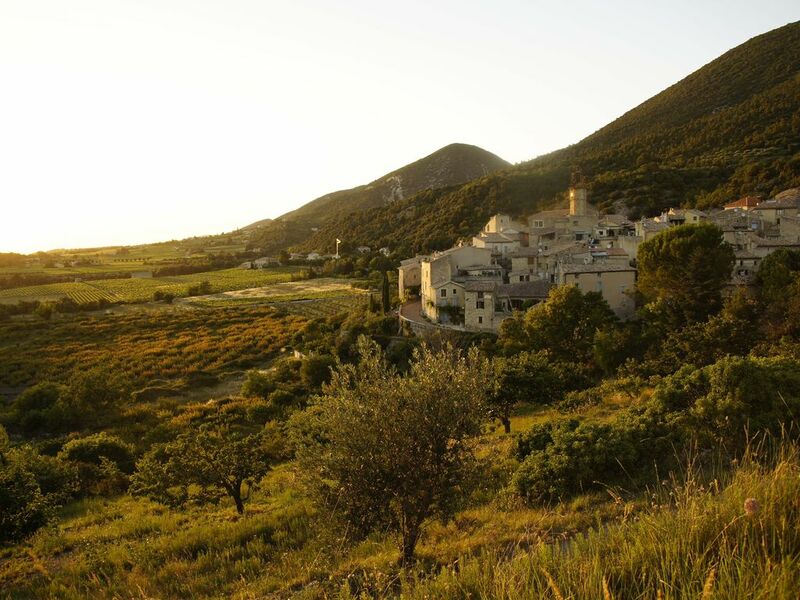 ), giving it a pleasing topography -- a landscape defined by vineyards, olive trees and green ridges. (We had weather luck: only 2 or 3 days of temps above high 80s). You can work very hard and make many day trips. Vaison, Avignon, Orange, Aix, Arles and other well known destinations are an hour to 90 minutes away. It's even possible to get to the Riviera in about 2 and a half hours (we did a day trip to Cassis. loved the Calanques boat trip. didn't like the beach and the crowds). We also did a very nice, very manageable day trip into the Alps. Ultimately, we preferred hanging out in Venterol or in the nearby villages. George (the owner) was extremely helpful. He's owned the house in Venterol for 40 years, and he knows the region extremely well. He has an engaging expatriate sensibility. We valued his presence. The town has a small playground. There are plenty of hiking trails, swimming spots, and vast opportunities for biking. True village life in the South of France. If you're looking for luxury accommodations, keep looking. If you're looking for an authentic small village experience in the south of France, this is it. Close enough to Provence and all it has to offer, and also close to the Alps and less than a day's drive from Paris. Our family of seven stayed here for a week, and it was ideal for us. We really got to experience village life. For day trips, try Avignon, Aix-En-Provence, and the Gorge. There are other small villages in the area to explore also, like Grignan. George will take good care of you and he has great stories to tell. Highly recommended. 1. There are numerous aspects of the property description that are inaccurate and could affect your experience. Ask owner for floor plan. Bathroom is substandard--e.g., camp style showers. There is no separate living room--it is part of the master bedroom, so it cannot be used if someone is sleeping in this room. This would leave only the uncomfortable kitchen as a hang-out space. The laundry facility is shared with the owner and requires permission to enter his property. Furthermore, the machine has an extremely small capacity. The bathroom is located in the basement, two flights of stairs down from the bedrooms--very inconvenient in the event of a midnight bathroom need. The house is very dark. The natural light of this region is beautiful, but you wouldn't know it in this house. There are no clear views of the natural landscape--only of the next-door building. There is no outdoor space (e.g. patio, garden etc.) with this house except, again, for a courtyard which is part of the owner's house and you need to share with him. 2. The owner is not only 'in the village' as he suggests. He is in fact in an attached unit and makes his presence felt daily if not more often. For the first week of our 5-week stay, he made excuses to abruptly enter the unit every day. Even after that, he persistently hovered and badgered us (by loud knocking, rude emails, or hollering from the road) about various things. These ranged from aggressively telling us to turn off the lights (the place is extremely dark--see above), pressing us to water the flowers, threatening to keep our deposit, and judging the character of his renters. His ongoing insertions into our lives negatively affected our experience. It is unprecedented and unacceptable for a vacation rental. It seems that the owner is not cut out for vacation rental property management because he continually demonstrates he cares far more about his house than about the enjoyment of his renters. Overall, we think you can do much better for you money in this area. Go find the relaxing vacation rental experience you deserve to enjoy this beautiful part of the world. We stand behind the accuracy of our HomeAway pages. Our rental #4554 has a Living Room and 3 comfortable BRs on the 2nd floor. The spacious kitchen accommodates 6 to 7 people. French washing machines are narrow & deep. Our renter had never seen this style. We offer 2 machines side by side. An impeccably clean bathroom & fixtures were presented to Michael S… plus lots of freshly laundered towels & washcloths. Bath (2 sinks/2 showers), Toilet, Pantry & large Farm Kitchen are all on the 1st floor. Only bike storage is in the basement-cellar. Our large farm kitchen is well equipped. Implying “a number of additional things” were needed is deliberately misleading. We provide a large cutting board, knives, dishes & all cookware for preparing family meals. When he requested a small cutting board, we immediately gave him one of ours. No patio or garden has ever been offered with this property. An arcaded 12c courtyard was offered for breakfasts, drying laundry & "hanging out." We’ve had many dinners there, often joined by our renters. Michael S. opted not to use this space. There is no way to enter renter’s living space. The door bolts on his side. Just knowing an owner lives in an adjacent house seemed to vex Michael S. If this was a pivotal issue, he should have rented elsewhere. Despite his annoyance, some contact was necessary. Asked several times to water his flowers daily (as per his Contract), he eventually did. This renter paid nothing for 5 weeks of electricity. We don't use timed light switches but rely on guests being conscientious about energy usage. Until now, this hasn't been an issue. Because an electrical usage clause in his Contract was ignored, we had to remind him. He said he had no copy of his Contract. Renter was unaware that Provence houses are built to shield occupants from summer heat. Walls are thick & shutters closed mid-day to retain the coolness of dawn & dusk. Our HomeAway description states, “partial view of the vineyard valley below.” The balcony is a refuge on Venterol's edge, a place to watch swallows dip & dive at day’s end. We are sorry Michael S. did not enjoy our rental home during his cold, wet May stay. Our efforts continue to provide the same comfortable, clean & authentic rental property enjoyed by families from all over Europe, UK and the USA for more than twenty years. We are pleased that this is the only review of this kind we have ever received. My husband and I went to Paris, France for the first time together. We loved every minute of it. It was our getaway to Venterol that made the France trip so memorable. It was nice to get the train from Paris and be " in the country side." George, the owner/host really knows the area, and its history so well. He was a great travel guide. The day trip to Avignon is highly recommended. The house is so charming. The village is a peaceful to walk around. You get a true taste of the village life, with the village square and village church. The house is well maintained with a working kitchen and fridge. We would go shopping for bread, cheese and sausage and pack sandwiches for our day trips. This is a lovely and peaceful retreat house with a wonderful owner. Perché dans un charmant village à 4 km de Nyons, Venterol offre tous les avantages : près des commodités mais dans un environnement calme et préservé. Seule la cloche de l'église rythme le temps. Le gîte est une ancienne maison très bien décorée par Georges ce qui lui confère une âme. S'il faut faire la vaisselle et la lessive cela n'est pas grave car nous avons trouvé un endroit merveilleux. L'accueil de notre hôte à fini par nous charmer et ce n'est pas un scorpion dans la salle de bain qui nous fera changer d'avis. Nous reviendrons volontiers ! Venterol is a peaceful hillside Drome wine village in the Cotes-du-Rhone region near Nyons, Valreas & Vaison-la-Romaine. Olive orchards climb surrounding hills & lavender fields color the valley below. Our village lies on the southern side of small mountains bisected by streams filled with fossils & many popular hiking trails. Wild boar, chamois & fox are seen on back mountain lanes still used by sheep and goat herders. Venterol, as with so many close-by villages in Drome Provencal, is surrounded by vineyards and welcoming wine tasting 'caveaux'. Nyons right next door has a spacious municipal state- of- the- art Swim center for family fun and recreation. Close by streams and waterfalls provide additional picnic/swim opportunities. THIRD BEDROOM: A third bedroom may be added for 50 Euro supplement per each 2 week rental. with a 20% reduction on the 3rd and 4th weeks of every monthly rental.We give you a receipt. SECURITY Deposit / le Caution: A small Security Deposit is payable upon arrival in Venterol... Usually between 100 and 150 Euro. We give you a receipt. This is returned on your final morning prior to departure....provided the house is left in the same condition as found. The CLEAN UP CHARGE (for 1 to 4 week rental is 55,-- Euros for 2 to 5 occupants), and 80 Euros for 6 to 7 occupants.